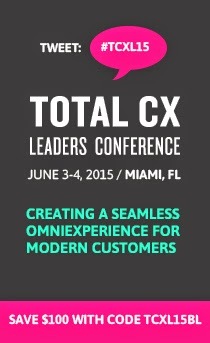 As we quickly gain on the next Total Customer Experience Leaders Summit in June, we'd like to occasionally share with you some of our favorite links of the week on customer experience, customer experience design, and overall customer-centricity. "That’s because the future of business isn’t tied to the permeation of Facebook, Twitter, smartphones, tablets or real-time geo-location check-ins. The future of business comes down to relevance and the ability to understand how technology affects decision making and behavior to the point where the recognition of new opportunities and the ability to strategically adapt to them becomes a competitive advantage." No specific Facebook post or mobile app will be able to create a customer experience design strategy, but being the sort of company that can embrace new technologies and trends early may be the differentiator you need. Experience Is The Next Frontier In Marketing." Plus, take a look at this post "The Customer Is Always Right? Wrong" by TheMana.gr, Flavio Martins, for insight into the "real gem hidden in...complaints." Lastly, here on the blog we announced the release of the 2012 Agenda for the 2nd Annual Total Customer Experience Leaders Summit. Download it today to view our whole exciting lineup! Is Your Company Meeting Consumer Expectations?